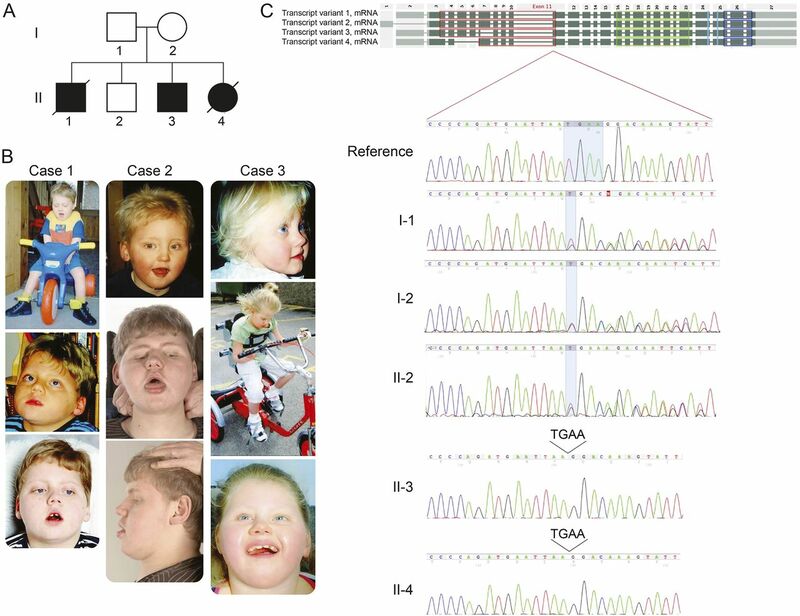 In the article “Mutation of TBCK causes a rare recessive developmental disorder” by R.J. Guerreiro et al.,1 there is an error in the figure, and 2 of the photos of male siblings in cases 1 and 2 were placed incorrectly. The corrected figure is shown below. The authors regret the error. (A) Pedigree showing complete segregation of the TBCK c.614_617del; p.205_206del mutation in the family members available for analysis. (B) Photographs of the affected siblings. (C) Sanger sequencing traces for all family members available for analysis (2 affected siblings, the parents, and 1 unaffected sibling). The 3 upper chromatograms represent a reference sequence and the unaffected family members where the heterozygous deletion can be observed. The 2 lower chromatograms represent 2 of the affected siblings where the same deletion can be observed in homozygosity.
. Mutation of TBCK causes a rare recessive developmental disorder. Neurol Genet 2016;2:e76. doi: 10.1212/NXG.0000000000000076.